Andrew Johnson had a significant influence on the “look” of north Mississippi in the late 1800’s and early 1900’s. Born in Sweden, he brought an innate sense of design to this area evidenced by the 77 structures attributed to him, 21 of which are on the National Register of Historic Places. 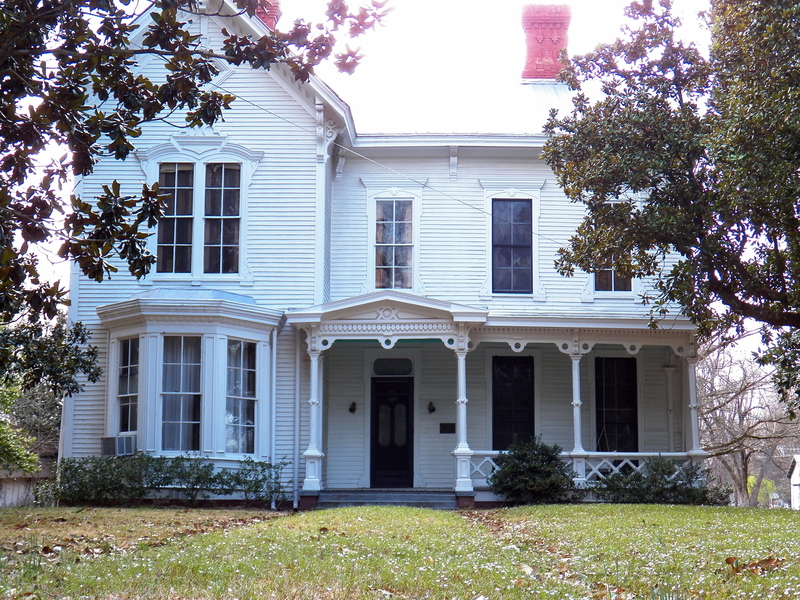 The Lavender house is an example of the simplified Greek-Revival homes that were in Sardis, Mississippi, in the pre-Civil War era (prior to 1865). CLICK TO ENLARGE: Cottages similar to this cottage would have been seen when Anders was growing up in Sweden. Photograph provided by Magnus Ortegren. distinctively embellished small cottages and grand two-story Queen Anne houses. Johnson’s signature style included arched windows with bracketed hood moldings, porches richly decorated with delicately pierced brackets, bay windows, and front entry doors surrounded by sidelights and segmented transoms. He made generous use of stock millwork, which was becoming more available, and no doubt studied the writings and drawings of A. J. Downing. With his memories of decorated cottages in Sweden and ornate churches, he created a style all his own. 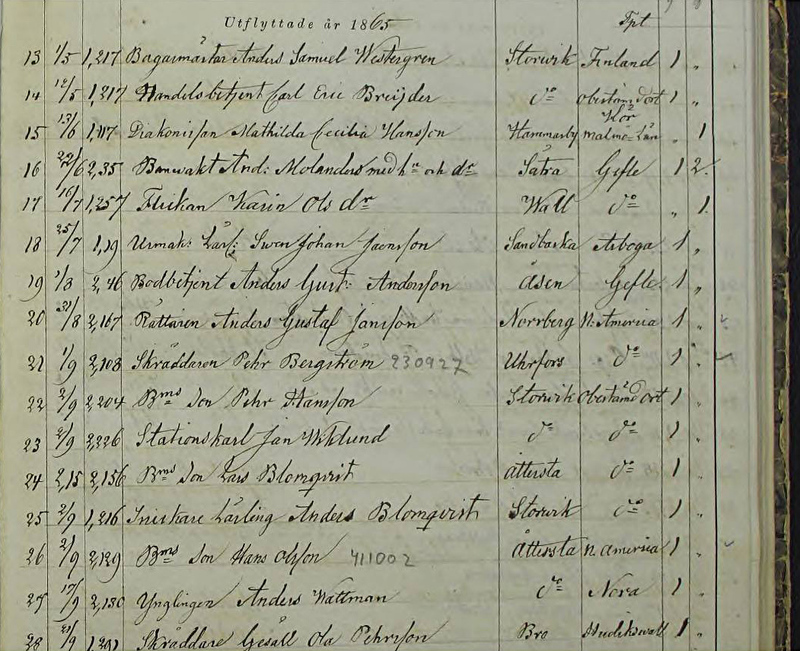 There is evidence that Per Jönsson, grandfather to Anders, was born at the farm “Liss-Jönses” in Övermyra in 1771. Per Jönsson later married and moved to Yttermyra nearby. CLICK TO ENLARGE: This document proves that at least since 1567 the farm had been in Övermyra. Courtesy of Britt-Marie Sohlstrom. This area dates back to the Vikings. Iron was found in the rivers and streams around Yttermyra very early. 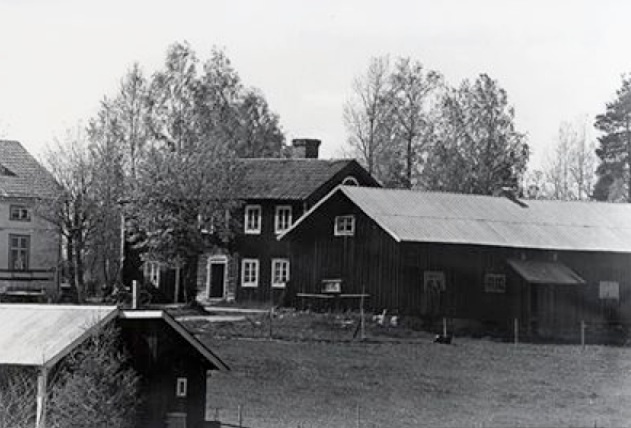 The farm in Yttermyra where Anders lived was named, ”Per Jöns.” It was a farm passed down by Anders’ paternal grandmother to Anders’ father. 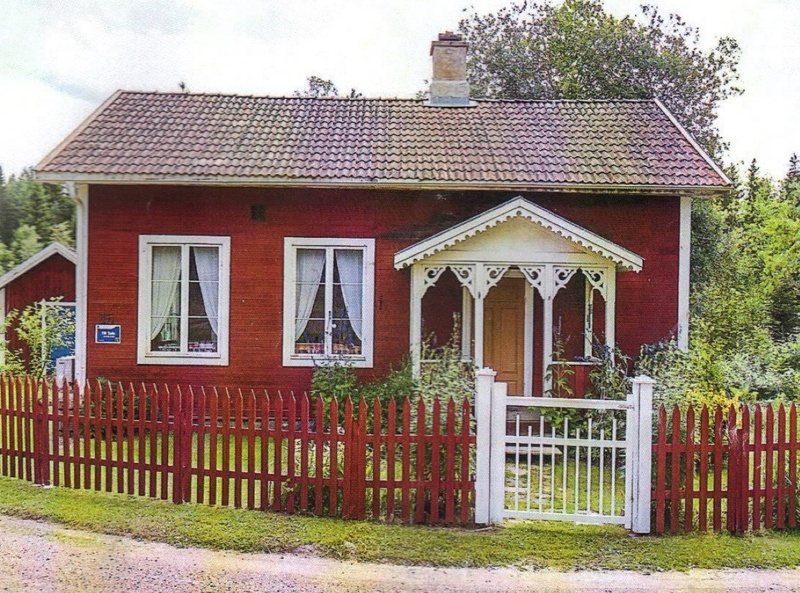 All the family moved to the village of Attersta when the original farm in Yttermyra was sold around 1861. Little is known about Jönsson‘s education. He is shown as living in Ovansjö with his family in a parish book. In this same book it says that Jönsson was accepted in the army and had been to one meeting. House believed to be the original farm in Yttermyra. He is mentioned also as living in Storvik for half of a year in 1865. He is also called a “snickarlarling,” which means he was training to be a carpenter. It makes no mention of him attending a school for this so he was most likely an apprentice. The town of Storvik was a small village in the 1800’s. Kungsgården is a village and the old center of the parish Ovansjö. As the railway came, the village of Storvik grew rapidly and became the new center. There was a large three-story house in Storvik that resembled the homes built by Andrew Johnson in Mississippi. It was named Knuss-Pellas, and it was built in 1860. The next notation in the parish book says that Anders and brother, Lars Thore, who was two years younger, moved away to an unknown place in 1865. After that, little was known about them in Sweden. Lars Thore Jönsson, circa 1865. Photograph provided by Britt-Marie Sohlstrom. 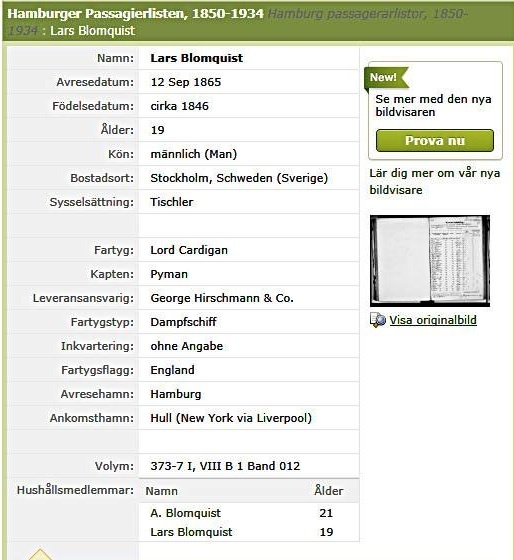 It appears that Anders Jönsson and Lars Thore Jönsson used the last name, Blomquist, when they made their crossing to America. This would not have been unusual at the time. In 1865 and in years prior to that the Swedish practiced “patronymikon,” which means names for boys were taken from their father’s name. Therefore, Anders was named Jönsson, which literally means the son of a man whose first name is Jöns. This created confusion, but it was very common with farmers. Once a boy decided to go into the army or to seek a trade, he had to select another name to distinguish himself. There were just too many Jönssons and Anderssons. 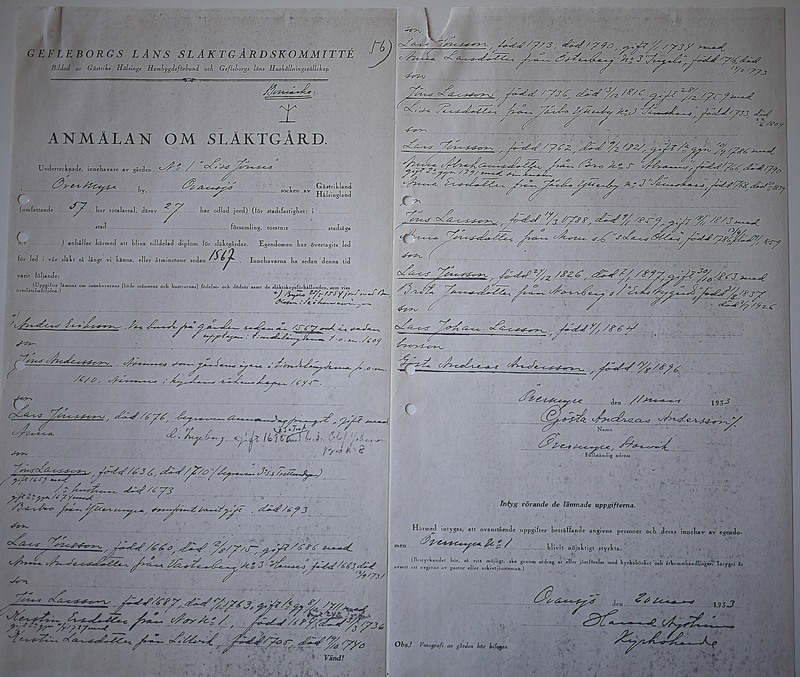 Thus, Anders and Lars used the name Blomquist when they sailed from Stockholm on September 12, 1865. It appears they sailed to Germany, and then they probably took a train to Hamburg. CLICK TO ENLARGE: Passenger list taken from Ancestry.com. Courtesy of Britt-Marie Sohlstrom. CLICK TO ENLARGE: Passenger list summary taken from Ancestry.com. Courtesy of Britt-Marie Sohlstrom. Then Anders and Lars boarded the steamship, Lord Cardigan, and sailed to the port in Hull, England, which was a major port on the route of Northern Europeans to America. They then sailed to Liverpool and finally New York. They probably landed in Castle Garden, New York (Ellis Island was not yet open), after sailing a minimum of thirty days across the Atlantic. Why did Anders and Lars want to make this long trip to America? In 1865 there were not many opportunities in Sweden to make money. They had heard stories about how much money people had in America, and they probably decided to see if they could make money as well. One family story that has persisted over the years but cannot be confirmed is that Anders was working on a building at Uppsala University before they left for America. (Keller/Everitt Letter, October 19, 1980) He was the youngest craftsman on the job, and the window that he built was chosen for a prize of about $100 by the King of Sweden. This could have happened in early 1865 in the six months that he is listed as being away from his home in Ovansjö. As noted above, he is listed in the parish book as “snickarlarling,” which means he was training to be a carpenter. If this story is true, it would have provided needed funds for Lars and Anders to travel to America. After landing in New York, Anders Jönsson’s name was changed again to Andrew Johnson. 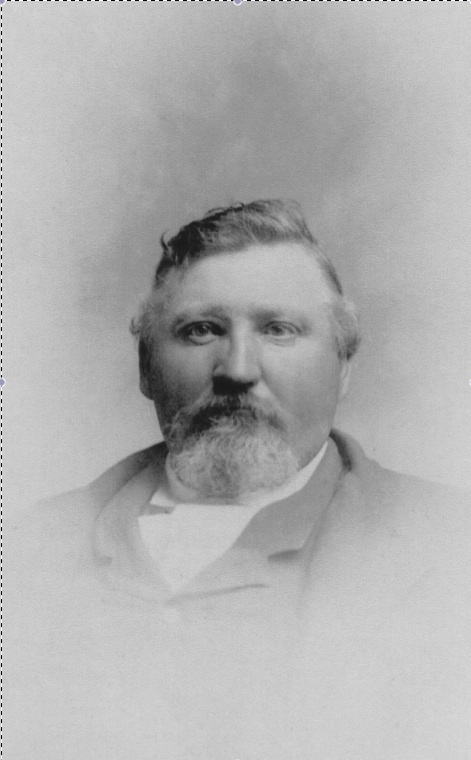 Not much is known about Lars’ life in America except what is stated in his father’s, Jöns Persson’s, probate report in 1887. It states that Lars is dead, but he has a daughter, Jenny, living in America. Some research suggests Jenny may have died in the 1906 San Francisco earthquake. Andrew went from New York to Chicago by train and settled in a Swedish colony in Evanston, Illinois, just outside of Chicago. It is believed he went to work for the Illinois Central Railroad and studied English at night. Anna Nilsson. Photograph may have been taken in Washington, D.C. in 1910. Photograph courtesy of James H. and Gene Thornton. Andrew had promised his fiancée, Anna Nilsson, that if he could make enough money to send for her in one year he would stay and send her money to come join him. That’s what he was able to do. Their banns of marriage had been read in the Lutheran parish church in Sweden for three consecutive Sundays before he left for America. That was the tradition in Sweden. Anna Nilsson arrived in New York on July 4, 1866, after an arduous journey of more than a month. She was confused by all the excitement of that holiday. Anna and Andrew were married August 4, 1866, and were very happy in Evanston among Swedish friends and learning English. They lived in an eleven room house. 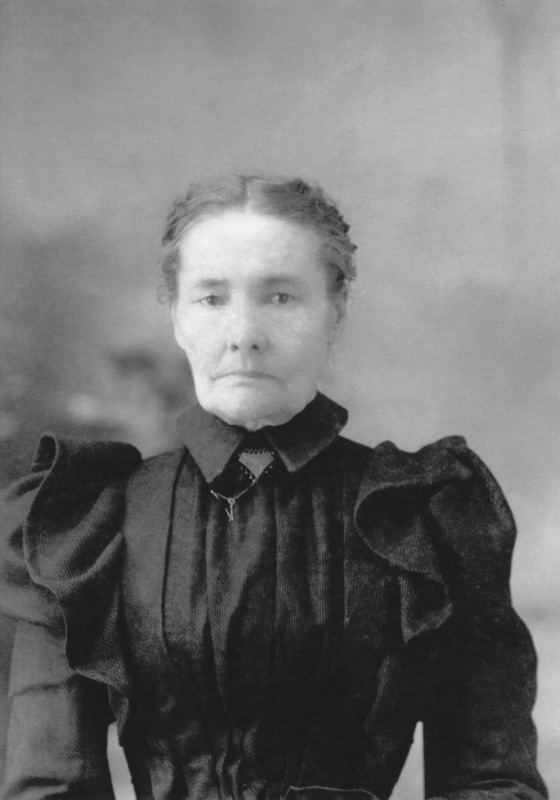 They had their first child there, Anna Lydia Johnson, born on April 28, 1868. Only speculation exists as to exactly why and how Andrew and Anna came to settle in the small North Mississippi town of Sardis. This is presumed to be a drawing of the church. Drawing is taken from the booklet, “Sardis United Methodist Church, Cornerstone Centennial,” compiled and printed by Cris Fletcher, Nov. 9, 2008. One belief is that he was hired by the Illinois Central Railway to build depots between Chicago and Memphis. Since the Illinois Central did not own that stretch of railway in the late 1860’s, this is unlikely. 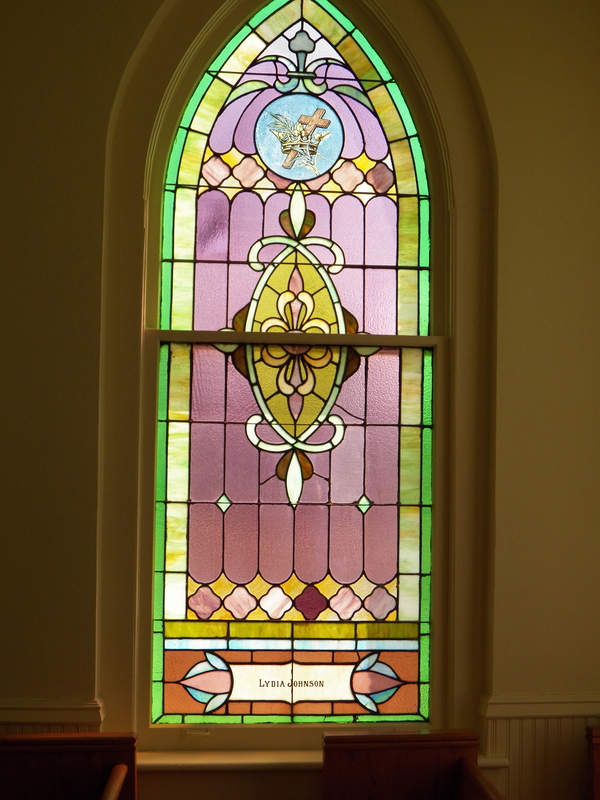 Another is that he came to build the first Methodist Church in Sardis. This may very well be true, but how he found out about the project is a mystery. Some family stories say they had been living in Cairo, Illinois, just before coming to Sardis. This would have made it more likely he would hear about the church job, but there’s no solid evidence they lived in Cairo. What is known is he came south with a crew of Swedish workers and was granted the contract to build the Methodist Church for $5,270 in 1870. This would mean he probably arrived in Sardis sometime between the summer of 1868 and the end of 1869. 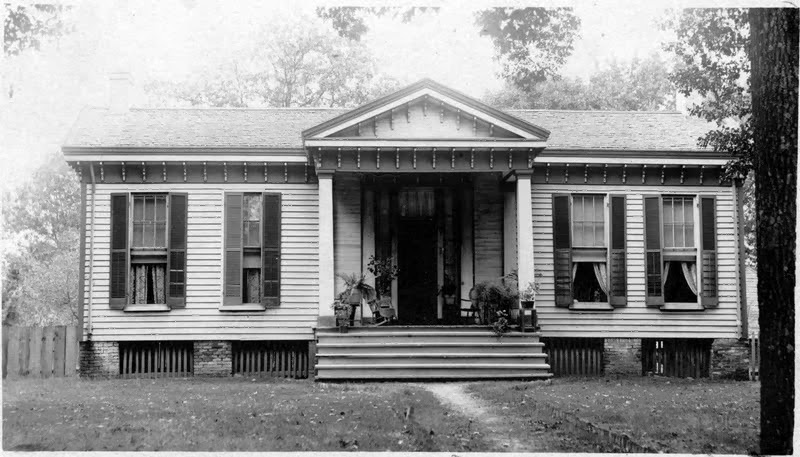 In Sardis, Johnson began building houses in 1870, as well as other buildings. The first house he completed was the Ballentine-Seay house, one of his most ornate houses. This house is at the corner of Pocahontas & Carlee streets. 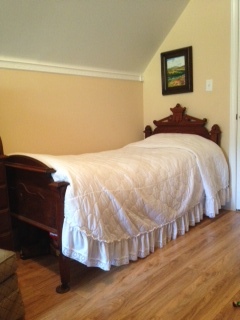 It is listed in the National Register of Historic Places and is still in excellent condition. Photograph taken by Jim Utterback 2014. Johnson also started work on his own home at 111 Stonewall Street (the Johnson-Tate Cottage), which was completed in 1873. This was the first of his L-shaped cottages. Rendering by Andrew Johnson showing cottage and grounds. 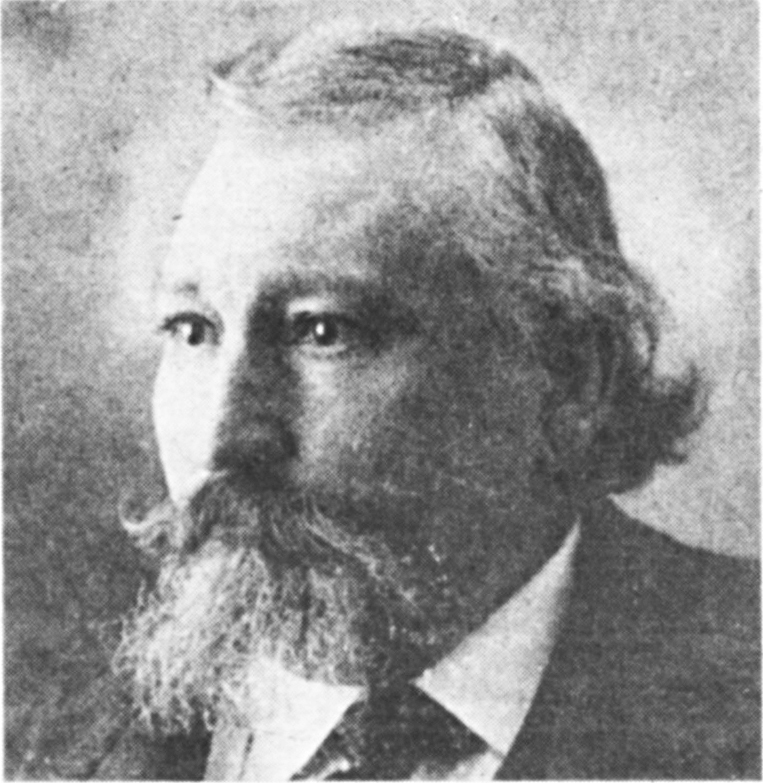 Date circa 1900. Courtesy of John Claude Johnson. A watercolor rendering owned by his great-grandson, John Claude Johnson, shows the cottage surrounded by a pasture and fruit orchard. The house includes many of Johnson’s architectural details like a glass transom over the entry door and a spacious porch. The interior showcased beautiful milled wooden baseboards, iron and wooden mantles, and glass chandeliers. Early in Johnson’s career in North Mississippi, he made the acquaintance of internationally known architect, James B. Cook, who had moved from London to Memphis, Tennessee, in 1855. Cook had been a supervising architect on the Crystal Palace for London’s Great Exhibition of 1851. The Panola County Courthouse in Sardis, Mississippi. Taken from: History of Panola County Mississippi, Panola County Genealogical and Historical Society, 1984. Cook came to America and lived in New York for two years before moving to Memphis to supervise the expansion of the Gayoso Hotel at the request of the Cincinnati firm of Isaiah Rogers. Cook lived the rest of his life in Memphis and designed many buildings in Memphis and the surrounding area. 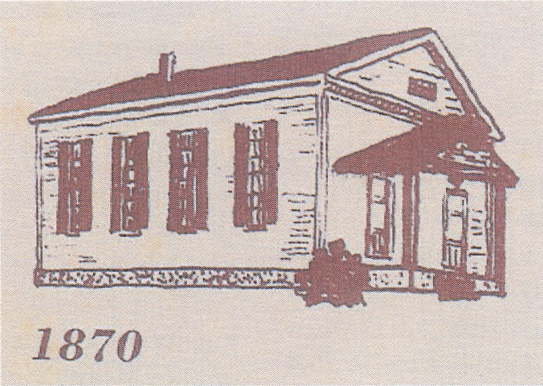 Cook was brought to Mississippi, to design the Sardis jail. He had a unique jail design that was advertised as being escape proof, and he had built a large jail in Memphis in 1868. 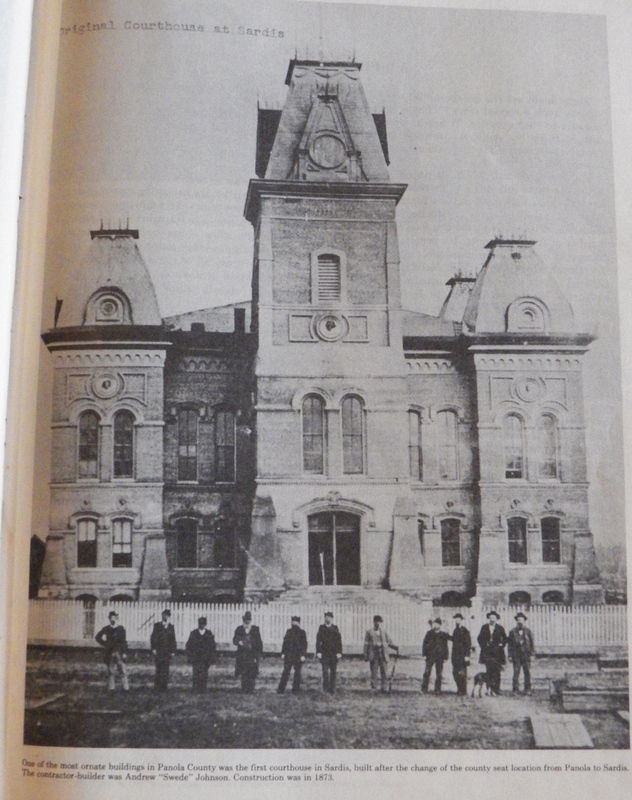 Johnson was hired to build the Sardis jail for the sum of $12,700, which was the lowest bid. It was completed in 1871. 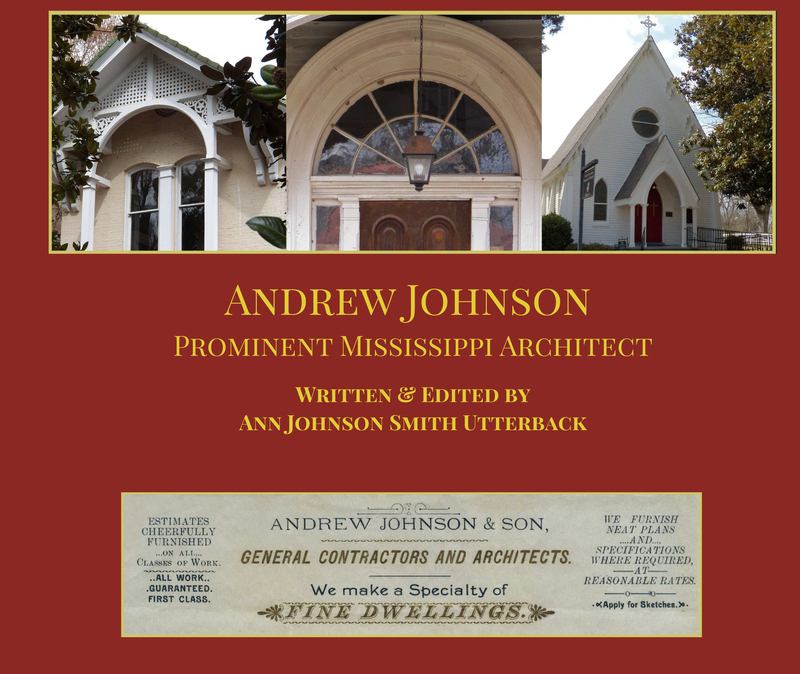 Johnson went on to build three more (documented) projects for Cook: The N. R. Sledge Store in Como (1872), Holy Innocents Episcopal Church in Como (1872), and the Panola County Courthouse in Sardis (1873). These last two were show places and, no doubt, gave Johnson more credibility as a builder. Family photograph probably taken in May of 1910 in Washington. Johnson was noted for his size and his personality in newspaper articles of the time and in family stories. He was over six feet tall, which was tall for a man at that time, and he weighed more than 300 pounds in his later years. Johnson’s size was only matched by his generosity and character. He often brought farmers and workmen home to dinner. Family stories relate that he was a hard, but fair boss. There are several mentions in the Panola Star newspaper and The Southern Reporter of Johnson stopping by the newspaper office to drop off peaches from his yard or do other good deeds. Andrew & Anna Johnson with children. 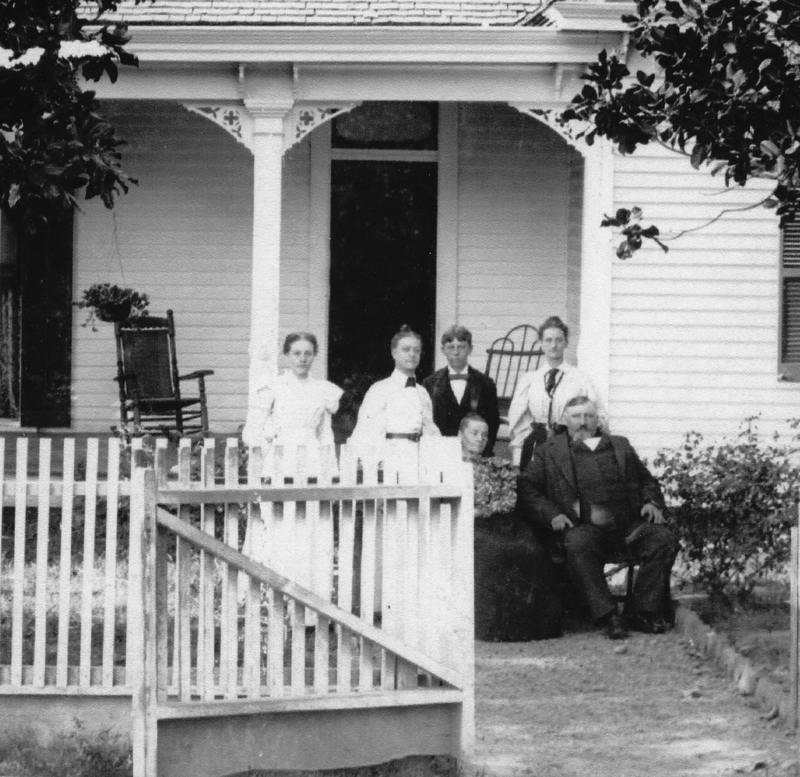 Family photograph taken around 1895 or 1896. One family story that highlights Johnson’s moral character has to do with the yellow fever epidemic of 1905. A train came through Sardis carrying the body of a man who died of the fever while on the train. The body was dumped outside of Sardis. No one but Johnson would take custody of the body and give it a proper burial. The screen door elicited much talk around the town since many people thought it would block the fresh air coming into the house. The other topic of conversation around town was Johnson’s bathtub. He had a Memphis tinner come and build a tub big enough to accommodate his large size. It was made of either tin or zinc and covered with as many as 72 coats of white enamel. (Keller/Everitt Letter, October 19, 1980) This tub was in stark contrast to the small, beautifully made, walnut single bed in which he slept. Even with his success as an architect, Johnson’s life was not without challenges. Beginning a career in America as a non-native speaking immigrant could not have been easy. Relocating to Mississippi had hardships as well, especially with his wife and small baby. Anna Lydia (born in 1868) brought her own challenges. She was evidently born with scoliosis or some spinal problem. 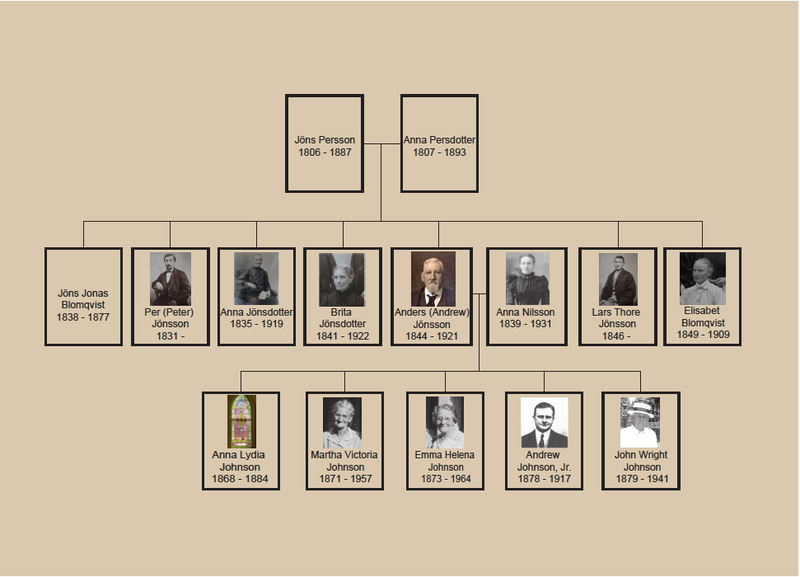 In 1872, not long after the Johnsons settled in Sardis, Andrew took his daughter to Indianapolis to the renowned Dr. Allen’s Surgical Institute to have her spine straightened. She was just four years old at the time. The Panola Star reported that the surgery was successful. (June 1, 1872) Twelve years after Anna Lydia’s surgery, however, she suffered a fall from a horse and gravely injured her spine. She survived a short time before dying of her injuries on September 24, 1884, at the age of 16. Andrew Johnson, probably taken in Washington, D.C., around 1900. Family Photograph. The Southern Reporter gave details of him living in Oakland, Mississippi, in 1896 working on the Newberger Brothers storehouse; in Como, Mississippi, in 1899 working on three jobs (the R. M. Short house, the Craig house, and the Pointer/Wesson Store); in Lexington, Mississippi, in 1902 building a bank; in Coffeeville, Mississippi, in 1905 working on a church; in Byhalia, Mississippi, in 1906 working on another church; in Water Valley, Mississippi, in 1907 building yet another church. Surely these sojourns could not have been easy on him or his family. Johnson also had to rely on ingenuity when the building business hit slow times. In 1888, The Southern Reporter related that Johnson was building coffins during a slack period. 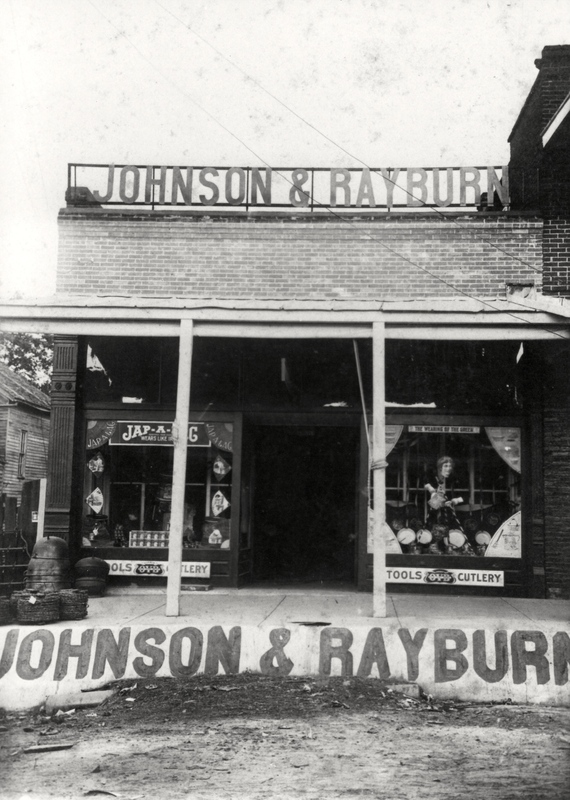 Johnson Hardware Store, Family Photograph. Despite his constant work, there were many happy occasions in the Johnson home. 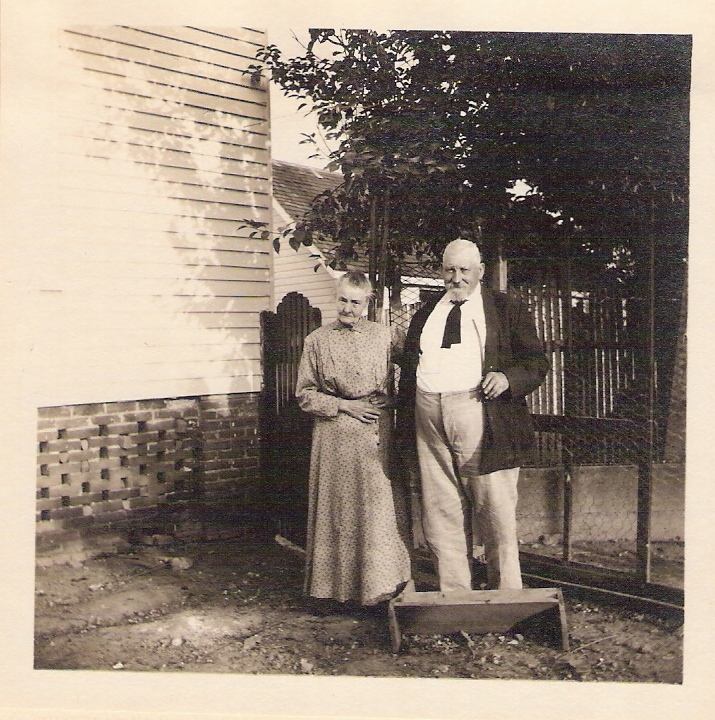 On January 25, 1899, his daughter, Martha Victoria, married Robert Lee Thornton in the Johnson home. Three years later on June 5, 1901, Emma Helena married Charles Albert Anderson there as well. Anna Nilsson and Andrew Johnson, around 1913. Family photograph. Anna and Andrew also made several trips together to Washington, D.C., where their oldest son, Andrew, was working in the Navy Yard. In May of 1910, they spent a month in D.C.
Around 1899, the newspapers began reports of Johnson being unwell. On February 3, 1899, The Southern Reporter wrote that he had been sick but was improving. 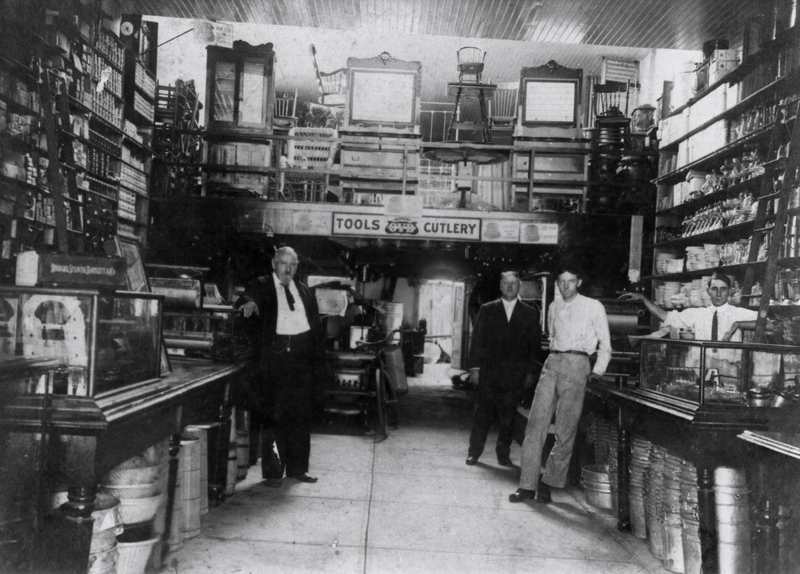 Interior of Johnson Store. Two men in suits from left to right: Andrew Johnson, John Wright Johnson. Family photograph. In 1905, the newspaper reported that Johnson had been confined to his home for three weeks following an operation to repair his leg after a fall. By 1910 it appears Johnson had ended his building career. 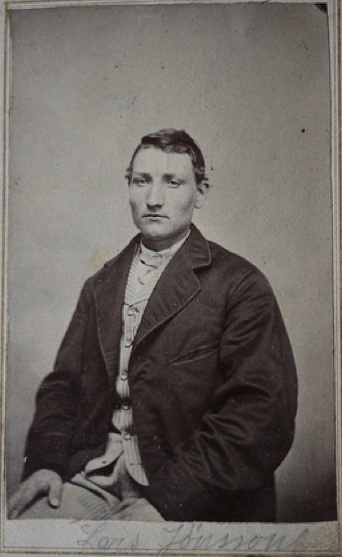 Andrew Johnson, Jr., shortly before his death. Taken from the East Gun Carriage Relief Association Yearbook, 1917. Johnson Sr.’s health conditions. But Johnson Jr. was was so sick when he arrived that he was put to bed and the doctor called (The Southern Reporter, July 27, 1917). That same day, Johnson Sr. was taken to Memphis, Tennessee, to the hospital for treatment. His foot was amputated due to diabetes and for several days the outlook was grim. During that week, Johnson, Jr., got progressively more ill from the same disease his father had, diabetes. He was also admitted to the hospital in Memphis, and, unfortunately, after a week there, he died on July 29, 1917. 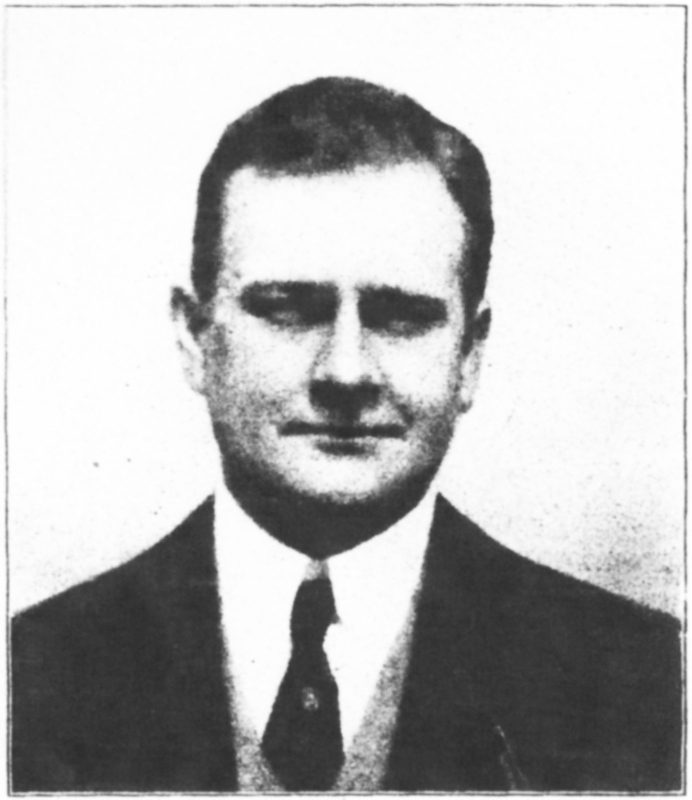 His death was announced in The Southern Reporter on August 3, 1917, as well as in the East Gun Carriage Relief Association Yearbook at the Navy Yard in D.C.
After Johnson, Sr., had his foot amputated, The Southern Reporter wrote that he was getting around in a roller chair (August 24, 1917). 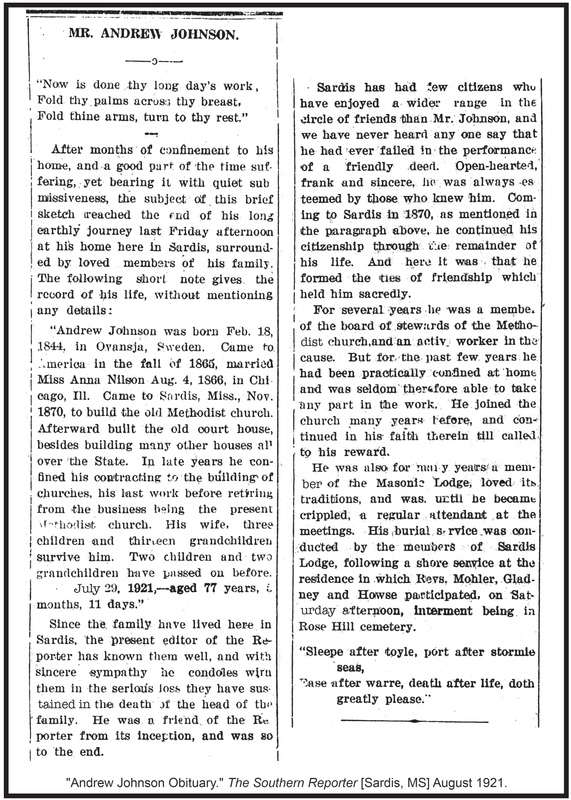 His obituary stated that he had been confined to his home in the spring of 1921 and had suffered for months. According to his will dated February 23, 1921, at his death he owned four brick buildings in downtown Sardis, his own home (Johnson-Tate Cottage), several acres of land in Sardis, and bank stock. But his legacy was not in what he owned when he died, but in what he left behind. 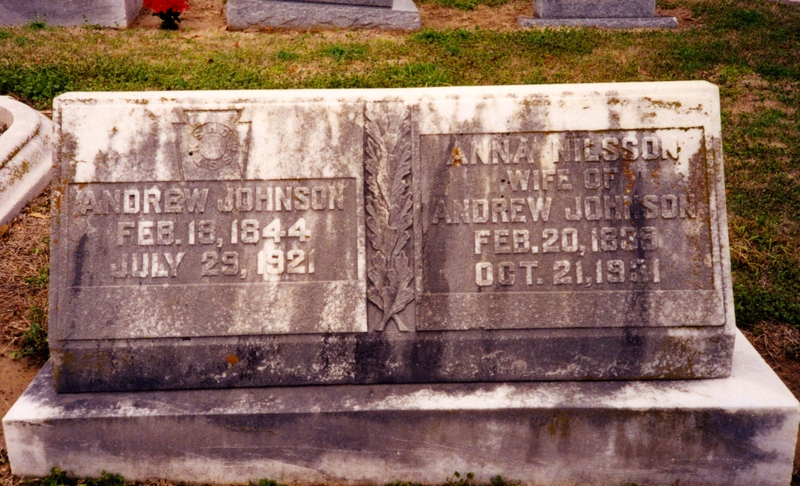 Andrew and Anna Johnson gravestone, Rose Hill Cemetery, Sardis, Mississippi.